Rising star Danny Dignum hopes a win over Aryee Ayittey this week can propel him towards fights with the likes of Mark Heffron in the near future. Dignum (9-0-KO5) takes on Ayittey on an MTK Global show live on iFL TV at York Hall on Friday. Ayittey previously fought Heffron back in October, and Dignum hopes he can beat him in quicker fashion and send out a statement to his domestic rivals. Dignum said: “Mark Heffron got him out of there in four rounds, and I’d like to get him out there early as well. If I don’t get him out earlier then doing the rounds will give me great experience. “I believe it’s not long before I start taking on the likes of Mark Heffron or similar opponents like that. Don’t get me wrong, I rate Mark Heffron, but I also believe in my own ability. “Ayittey got a very good record and I need fights like this for me to push towards titles. It’s a step up but it’s going to bring the best out of me. Dignum’s fight can be seen live on iFL TV, and the main event of the show at York Hall on Friday sees Paddy Gallagher take on Freddy Kiwitt for the vacant WBO European welterweight title. Exciting prospect Josh Adewale is promising a special performance when he returns to the ring next week for his second professional fight. Adewale (1-0) competes at York Hall against Casey Blair on Febraury 22, and he’s looking to build on the impressive win he picked up in his debut against Liam Griffiths in November. He said: “Now that the debut is out of the way I feel that I can get down to business. On my debut I looked at it differently and was doing things I didn’t need to do, but for this one I want to take care of it properly. “I had a week or two off after my debut but then I was straight back into training and I was working hard the way through Christmas. I prefer to be busy so I can’t wait to get back in the ring. “It’s going to be good to fight at York Hall. I meant to fight there as an amateur but didn’t get the decision I should have got, so I missed out on that chance. “Most of the fights I’ve watched have been there, so I’m really looking forward to it. “It’s been a good transition from amateur to professional. As an amateur I did a lot of stuff on my own and didn’t have must of a routine, but now things are structured and everything is good. Adewale is part of a packed bill at York Hall that will be shown live on iFL TV, and features a WBO European welterweight title fight between Paddy Gallagher and Freddy Kiwitt in the main event. 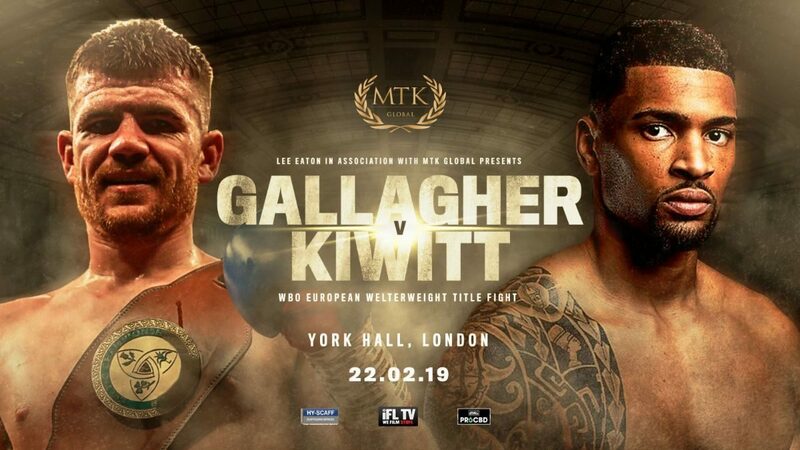 Danny Dignum leads a stellar undercard as MTK Global heads to York Hall for their latest fight night event on Friday 22 February. The hard-hitting middleweight (9-0, KO5) will look to extend his unbeaten record when he returns to action fresh off of his impressive third round stoppage win against Alistair Warren in December. Light heavyweight talent Dan Azeez (6-0 KO3) is on the card too, as he competes for the first time since defeating former Commonwealth champion Charles Adamu in October. Super lightweight Siar Ozgul (14-2) returns after going the distance with ex-world champion Viktor Postol in November, while welterweight prospect Liam Wells (3-0) fights for the fourth time. Exciting prospect Danny Egbunike (3-0 KO2) will be searching for his third stoppage victory on the bill, plus Jack Ewbank (1-0) will try to make it two wins from two in the paid ranks. Middleweight Donovan Mortlock (1-0) is in action, and there’s a debut for Michael Elliott as he takes his first step as a professional. Billy Underwood (1-0), Josh Adewale (1-0), Josh Paine (1-0) and debutant Huzaifah Iqbal complete the list of fighters on the undercard.